Using Bazi and Vedic Astrology, we can use it to put up a predictive chart comparison between the two leader of who is most likely going to win the 8 November Presidency Election. While this may not be 100% representative of the result , the Trinity rule of achieving Heaven 33.3% (their birth chart) , Man 33.3%(their strategy and action) and Earth 33.3% (Feng Shui of their place) luck is involved. 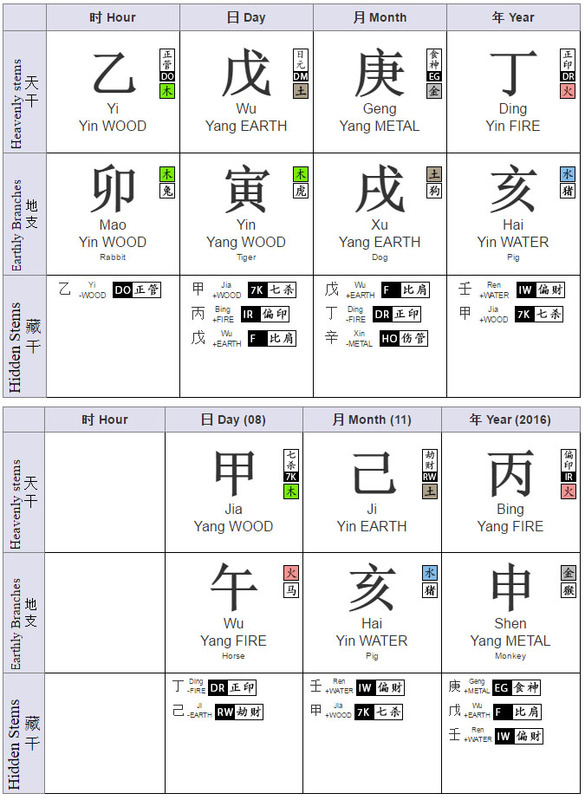 To achieve a higher accuracy, we need to know the Feng Shui residency of both candidates, as the Earth energy contribute a further 33.3% to their success. Donald Trump has a Feng Shui master to aid him, so he might be having the advantage of Earth energy to assist him in the election, while there wasn't any news of Hillary Clinton having one. In view of America vedic chart, it is going through a period of challenges and obstacles and thus the one that might finally get to win as president may be running its bad luck cycle. The candidate with the better luck pillar may not rule the country after all. These calculation and prediction below are solely based on Chinese Bazi system and Vedic Astrology and is not fully representative of Master Kevin Foong political view on the United States. We are only using Heaven and future time to do the predictive model. Hillary Diane Rodham Clinton (born October 26, 1947 8.00am Chicago) is an American politician and the nominee of the Democratic Party for President of the United States in the 2016 election. She served as the 67th United States Secretary of State from 2009 to 2013, the junior United States Senator representing New York from 2001 to 2009, First Lady of the United States during the presidency of husband Bill Clinton from 1993 to 2001, and First Lady of Arkansas during his governorship from 1979 to 1981 and from 1983 to 1992. Born in Chicago and raised in the suburban town of Park Ridge, Illinois, Clinton attended Wellesley College, graduating in 1969, and earned a J.D. from Yale Law School in 1973. After serving as a congressional legal counsel, she moved to Arkansas, marrying Bill Clinton in 1975. In 1977, she co-founded Arkansas Advocates for Children and Families. She was appointed the first female chair of the Legal Services Corporation in 1978, and, the following year, became the first woman partner at Rose Law Firm. As First Lady of Arkansas, she led a task force whose recommendations helped reform Arkansas's public schools, and served on several corporate boards. Clinton was elected in 2000 as the first female senator from New York, the only first lady ever to have sought elective office. Following the September 11 attacks, she voted to approve the war in Afghanistan. She also voted for the Iraq Resolution (a vote she later said she regretted). Let's look at the Bazi, Four Pillar of Destiny Chart of Hillary Clinton. Time is readjusted based on Longitude and location. Hillary Clinton Bazi chart generated from our Free Bazi Calculator. Born in 丁亥 Ding Hai Year and 庚戌 Geng Xu Month, one can see there are multiple Officer Stars (DO) and (7K) in her day and hour pillar. This suggest nobility status in her natal chart and high chance of taking official duty at her later stage in life. The Officer Star of 7K (7 Killing) indicates nobility status in her life but not one without stress. She was already serving as a congressional legal counsel at an early age. Marrying Bill Clinton would bring this chart to the next level, as her wealth status would leap to the next stage. The 7K Star in the spouse palace speak of a powerful husband who is in control and most likely influence her in taking administrative duty in the congress. True enough, she was elected in 2000 and become the first lady ever to have sought elective office. The Direct Resource Star born in her Month stem indicate a highly intelligence and well-educated person. There is also a lot of supporters during the pre-election period. Currently in the luck pillar of 丁巳 Ding Si, both of which are solid Resource Stars, this pillar is the reason why she rise through the rank to take on the presidency. The last presidency is not in her favour as she lost to Obama, but the fire element present in this year time line may suggest a very different outcome. Now let's look at the election date of 8 November on the second chart compared with her natal chart. Officer star 7K is strong in the month, it denote a high intensity level of stress (it is common as election is drawing closer), but the Officer star also indicate taking office in the government administration, however not one without stress considering US economy outlook has been weak for past few years. 2016 with 丙申 Bing Shen year in the picture, the 丙 Bing Fire is extremely crucial as it aids as a support star for her campaign. 己亥 Ji Hai Month prove to be more lethal in terms of supporters who sees the promise she made in her campaign till date. 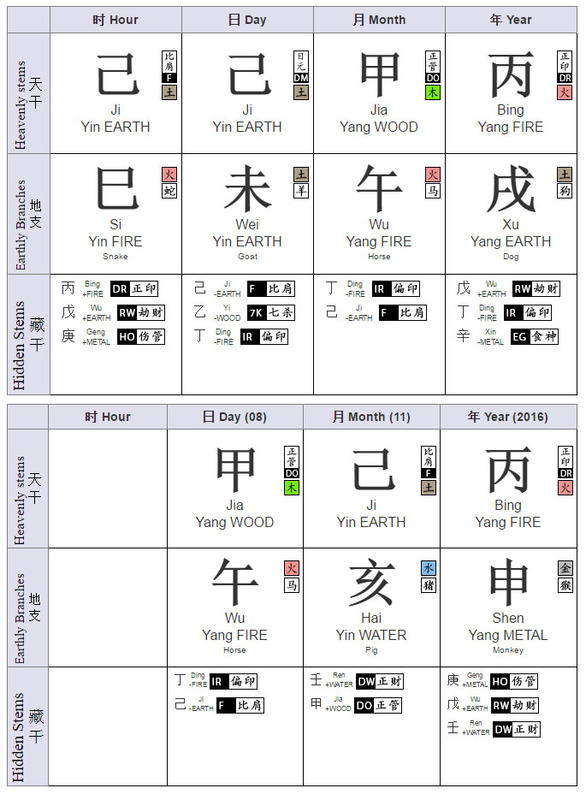 On the day itself it is 甲午 Jia Wu day, Wu is a Direct Resource star based on her natal chart, which denote even higher support on the actual day itself. The flow on energy on the Earthly branch on the actual day versus her natal chart is perfect. On the outlook based on Bazi chart, it seems to favor Hillary on the day itself. The hour of election can however affect the results further depending on how long the poll carry on. The longer the poll, it would be in Trump favors. Donald John Trump (born June 14, 1946) is an American businessman, television personality, author, politician, and nominee of the Republican Party for President of the United States in the 2016 election. He is chairman of The Trump Organization, which is the principal holding company for his real estate ventures and other business interests. Born and raised in New York City, Trump received a bachelor's degree in economics from the Wharton School of the University of Pennsylvania in 1968. While attending college, Trump worked in his father Fred Trump's real estate and construction firm. He was given control of the business in 1971 and later renamed it "The Trump Organization". During his career, Trump has built skyscrapers, hotels, casinos, golf courses, and numerous other developments across North and South America, Europe and Asia, many of which bear his name, such as the Trump Place apartment complex in Manhattan. He sought the Reform Party presidential nomination in 2000, but withdrew before voting began. Listed by Forbes among the world's wealthiest 500 billionaires, Trump and his businesses, as well as his personal life and political views, have for decades received considerable media exposure. He hosted and co-produced The Apprentice, a reality television series on NBC, from 2004 to 2015, for which he received a star on the Hollywood Walk of Fame. He has made cameo appearances in films and television series, and appeared at the Miss USA pageants, which he owned from 1996 to 2015. In June 2015, Trump announced his candidacy for president as a Republican and quickly emerged as the front-runner for his party's nomination. In May 2016, his remaining Republican rivals suspended their campaigns, and in July he was formally nominated for president at the 2016 Republican National Convention. Trump's 2016 presidential campaign has received a significant amount of media coverage and international attention. Many of his statements in interviews, on Twitter, and at campaign rallies have been controversial or false. Several rallies have been accompanied by protests or riots. Trump's positions include renegotiation of U.S.–China trade deals, opposition to particular trade agreements such as the TPP, stronger enforcement of immigration laws together with building a wall along the U.S.–Mexico border, reform of veterans' care, replacement of the Affordable Care Act, and tax cuts. In the wake of the 2015 San Bernardino attack, Trump called for a "total and complete shutdown of Muslims entering the United States" until "our elected officials can figure out what the hell is going on." This ban would exclude "U.S. citizens who are Muslim." He later said that the ban would focus instead on countries with a proven history of terrorism, until the level of vetting can be raised to screen out potential terrorists. Let's take a look at Donald Trump's Bazi chart. Donald Trump Bazi chart generated from our Free Bazi Calculator. Born in 丙戌 Bing Xu year, and 甲午 Jia Wu month. This is a very special chart in terms of its structure. Being an Indirect Resource structure on the month branch, one can say Donald Trump has a lot to offer for unconventional ideas of how he would run America. Some of his proposed policy are highly controversial, this is the unique star of Indirect Resource. He received a high level of support during his early campaign from 2015 due to the entrance of 丙 Bing Fire, which indicate the Direct Resource star being later half of 2015. This acts as the supporters star he received during these time. Even though most of the Republican have drop out of their support for him, he was eventually nominated at the Republican National Convention. The month energy of 己亥 Ji Hai, is not beneficial for him, as both got combined away by 甲午 Jia Wu on the actual day of election. There is also serious clash of 巳亥 Si Hai which suggest competition can be clashed away at the point of the election. It could be a last minute race to the top. Vedic astrology provide an excellent point of view for prediction as it is strictly based on planetary positions via the natal chart of these two individual from their date of birth and time. Let's look at Hillary Clinton vedic astrology chart. Currently, she is in Sun Major Period Feb 2015-2021, Mars sub period Dec 2015 - April 2016 and Rahu sub period April 2016 - Mar 2017. Being a Libra ascendant, she carries the sign of the scale which is known for fairness, harmony and known for social idealism. The lord of Libra, which is Venus is based on her first house, together with Mercury and Sun. Having venus in first house strength the Ascendant and provides high potential for a successful journey in her life. In the 10th house, which is also one of the finance houses and world achievements, there is a powerful combination of Mars and Saturn. Saturn is considered the planet of discipline and order, so one can expect her to achieve great achievement in her life through structural and organised behaviour traits. Although Mars and Saturn are considered destroyers or Malefics planet, the discipline in her will pull her through her wishes and demand. Mercury, being an intellect planet that governs the brain and nerve in in conjunction with the Ascendant. Mercury is present in her 9th house and 12th house, with 9th house for morale and luck; the 12th house for generosity and public services. Such combination is the result of Hillary involved in charitable organisation and many other social work for humanitarian. However, having Mercury as the lord in the 12th house also represent her hidden intention in her administration or the way she work. Looking at the current transit, she is in her Sun Major Period which starts since February 2016. With Sun being represented as Government and Power, this suggest the ability to rule a country. Moving on now to the predictive analysis, we see that Clinton is currently in her Sun Major Period, which began in February 2016. For Libra Rising, the Sun rules the 11th house, the sector of the chart that represents Goals, Ambitions, Accomplishments and Rewards. The Sun is the planet of Power and Authority, and its placement in the 1st house enhances the sense of Self, as well as signifying the power to rule over others. This is in addition to bringing the karma of the 11th house of Ambition and Accomplishment to the 1st house of Self. If she becomes the president, she will still be in her Sun Major Period throughout her term of office. The Rahu sub period continues till march 2017. Rahu is considered a weird planet as it represent transformation and uniqueness. However, Rahu at 8th house will have people exposing her misdeed (as reported over the email leak issue) or opponent that tries to bring her down. Jupiter is a great planet which represents opportunity and positive transition is going to transit to the 11th house, which is activated by her Sun Major period at the same time. This spell an excellent combination for acknowledgement and support by the masses. Mr Donald Trump being a Leo Ascendant has Mars on the 1st House. Leo exhibit the sense of pride, strong with their ego and clearly like to shine in the limelight. Mars however represent fiery, a fighter and aggression. In the show 'The Apprentice', one can see how Donald Trump infamous "you're fired!" slogan exhibit his leadership quality as well as his aggression. The lord of the first house Leo is Sun which is well position in 10th house which represent the finance, career and business. Rahu and Uranus share the same house with Sun, namely Rahu reflect a person who regard success as everything in his life. Rahu in Taurus represent financial success and asset gains. The characteristic of Leo amplifies this further through fame. Scorpio indicate strong intuition and having Moon in Scorpio allows him to read well on what people wants. Mercury in own sign Gemini increase his strength in communication, ideas and mass broadcasting. He is able to mine data to his advantage as Mercury is the planet of intelligence. All the successful politicians have exceptionally strengthen 12th house. Here we have Venus and Saturn in 12th house, don't be surprised he can get masses and the general public to like him. 12th house is regarded as the house of unknown. Saturn being a disciplinarian planet exhibit control, which is a gift for rulers, manipulator to get acknowledgement and recognition. Venus is the lord of the 10th house, as Venus is tied to enjoyment, entertainment, and fun, so TV series like the Apprentice are highly popular and sent him to fame. On the transit of the current planet now, Mr Donald Trump is in Rahu Major period that ends on November 2016. This means until November 2016, Rahu provides the success, public acknowledgement, and well placed in the 10th House which denotes Public action. Rahu with Sun in 10th house make him give unconventional speech in his policy suggestion which is highly controversial, taking massive risk which is perfect for the media exposure. Going through the Mars Sub Period, Mars is the lord of 9th house which stand for Luck and religion . Mars at the Ascendant 1st House makes him a strong fighter in the election. On a secondary outlook, the Mars sub period also activate the Scorpio, Moon and Ketu at 4th House which provides good intuition, the ability to counter his opponent swiftly but Ketu being unthinkable and unstable planet can cost him the election in his speech, offended many others during the period. This could have hurt his supporters who were strong in the initial period. The next major transit is the onset of Saturn, which will reach Moon this year. Saturn, being a disciplinarian planet, will dealt him a straight up setback. It also represent organisation and structural transformation. This suggest the reason why the Republican opposes him for presidency representation. American on the other hand have been tired of a long economics downturn for a long time, thus opting for a president that is willing to go against the norm is not surprising. However, without knowing their actual birth hour beside getting the information from the internet, feng shui of their place, Earth and Man luck, it can present a different view on the actual day. Given that America is going through a period of challenges and obstacles in 2017 onward to 2020, possibly the more unlucky candidate might get the upper hand. Worst, it could have lead America to a far worst outcome than before. Hillary Clinton wins in term of having better luck pillar than Donald Trump, but if America were to head towards a down fall from 2017 onward, would a better luck candidate win the presidency remains to be seen. Who knows, the worse luck candidate might get to rule America to complete the prophecy. As the date draw closer, we will update the planet movement based on Vedic Astrology for prediction. Interested to use Bazi to embark on the journey of success and take yourself to the path of least resistance? More at our Yin Yang Bazi Academy. Will Nathan Hartono Win Sing! China?